Motorola has been awfully quiet this year. 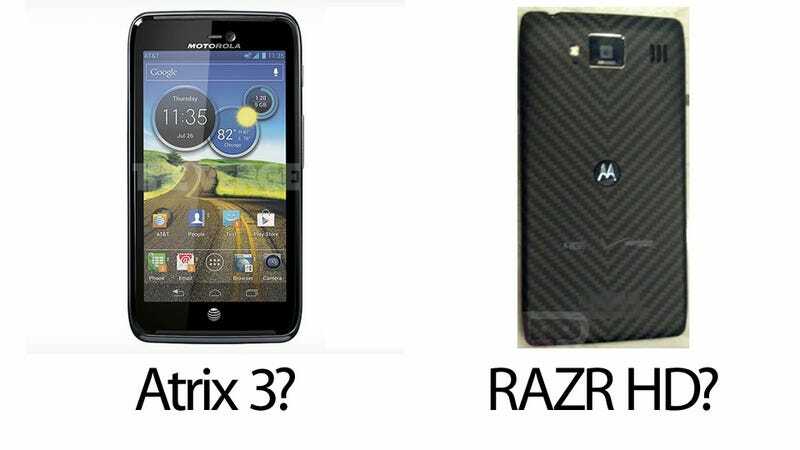 They haven't really announced anything since the RAZR MAXX back in January. In short, they're due. So it makes sense that we're finally seeing their high-end phones start to leak. We're ready. This morning The Verge received pictures of the Motorola "Dinara" which we assume is the Atrix 3. It's said to feature a 720p screen (finally) and Android 4.0. Other rumors speculate that it'll have a 13MP rear shooter and maybe even a 2MP front-facing camera for some 720p video chattin'. It clearly says AT&T and 4G LTE on it, too, which we'd expect. Other than that, details are scant, though it's rumored to use the Qualcomm Snapdragon S4 processor (dual-core 1.5GHz) that's on the Galaxy SIII and HTC One X (in their American versions). It's worth noting that there is clearly some kind of MotoBLUR going on still, so let's just hope they put it on with a light touch. Hot on the heels of that rumor, Droid-Life has scooped what may very well be the Droid RAZR HD. It's got that same high-tech looking kevlar back as the RAZR, so one would assume that tough and likely splash-proof. That also means that it won't have a removable battery, but it's rumored to pack in that same massive 3300 mAh battery that the RAZR MAXX has which should get you at least a day and a half of heavy LTE usage. Other rumored specs include the same cameras mentioned above and a 4.5-inch 720p screen, as well as the same processor, and same software (Android 4.0 with some Moto skin), and 1GB of RAM, which is the same as the One X, but only half of the 2GB RAM on the Galaxy SIII.